You completed an impressive 12 missions in 2015, 11 missions in 2016 and are set for another remarkable 12 missions in 2017. How do you see the trend of activity in 2018 and beyond? Arianespace should maintain a sustained operational activity in the coming years with an order book composed of 54 launches for 31 customers (as of 13/02/2017): 20 Ariane 5, 8 Vega and 26 Soyuz, including a bulk of 21 launches ordered in 2015 for the OneWeb constellation project. There is no doubt that 2018 will also be very busy for Arianespace! Are there certain factors or conditions that prevent Arianespace from launching even more missions? With its current capability, how many missions could Arianespace conceivably launch in a year without any delays? SATELLITE 2017 is only a few weeks away and this year’s Exhibition Floor will be the largest that the attendees have ever experienced! Don't miss this opportunity to visit and meet with over 350 exhibiting companies over the course of three days. Companies will showcase products and services from Amplifiers to Down Converters to Handsets to Network Management and Turnkey Providers. SATELLITE Week is the best time to see products up close and your chance to speak with the engineers and vendors that can answer questions about how services can help you reach your business goals even faster. We are pleased to confirm the speaker line-up for the SGx Keynote Series at SATELLITE 2017! SGx, which takes place from 9am to 5pm on Monday, March 6, is a series of short and informal TEDx-style talks, during which speakers share their inspirations and passions for space with an audience of SATELLITE attendees and young professionals. The event is produced by our partners at SGAC and the Future Space Leaders Foundation, and sponsored by Ball Aerospace and Blue Origin. For more information on the event, visit the SGx portal on the SATELLITE 2017 website. 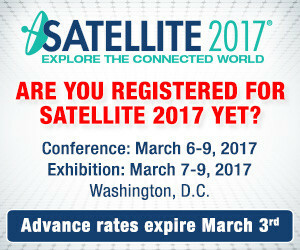 Michele Franci, CTO, Inmarsat Global, Ltd.
Only 12 Booths Left at SATELLITE 2017! The SATELLITE 2017 show floor is well on its way to being sold out. With only 12 booths remaining, this may be your last chance to display your latest technologies in front of more than 14,000 satellite and space professionals from all end-user markets. To reserve your space, simply complete, sign and email your exhibit space contract to Michael Cassinelli at mcassinelli@accessintel.com or fax to +1 (301) 576-5831. Have questions about exhibiting? Contact Michael Cassinelli at +1 (301) 354-1691 or mcassinelli@accessintel.com today to discuss the best place for your company on the show floor! Tue. March 7th | 6:30 - 10:30 p.m. The SSPI Hall of Fame recognizes the invaluable contributions of the visionaries who have transformed life on planet Earth for the better through satellite technology. Members of the Hall of Fame are recognized pioneers in communications, satellite-related aerospace, scientific research, or the development and delivery of applications for business, institutions and government via satellite. Join us in honoring leaders of our industry as SSPI inducts them in to the Satellite Hall of Fame! Kourou, 15/02/2017 - SKY Brasil-1, a telecommunications satellite made by Airbus Defence and Space for AT&T/DIRECTV, was successfully launched from the space centre at Kourou, French Guiana, on an Ariane 5 rocket. It was the 77th consecutive successful flight for Europe’s satellite launch vehicle.